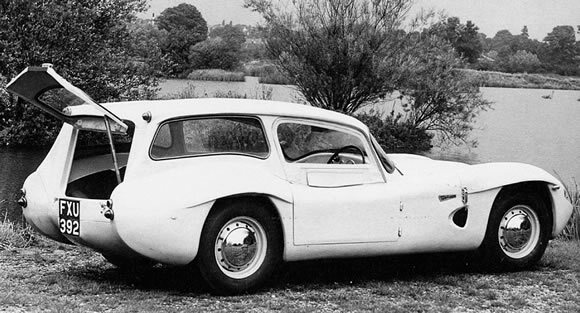 With probably the longest name in automotive history the 'Sportsbrake' is one very cool looking car. It looks like the love child of a Reliant Scimitar and a Jaguar XKSS to me. Tornado were a British outfit that built cars in the 50's, and up until 1964, when they stopped producing cars and became a successful body shop. Their cars had very cool names like; Typhoon, Tempest, Thunderbolt and of course Sportbrake. They were an early version of todays kit cars by being available fully built or as a kit and had a fibreglass body. They were a bit rough by some standards but with a 1172cc side valved flat head from a Ford 10, and basic mechanicals, they were easy to work on. The '10' stood for 10hp however the Ford 10 could really be modified to produce some decent horsepower. You will find lots of British 'Specials' from this era used the Ford 10 motor as a base and it was definitely good as proven by their race results. Reading about Tornado I discovered that everyone who worked there was a racer and it showed in the chassis. Handling is said to have been great, stopping not so good. Beautiful reminder of simpler times when you could work on your own car.